An Arriva double-decker bus, running route १०२ on the London Buses network. 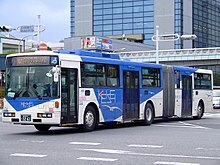 Volvo B10M articulated bus in Chiba, Japan. A school bus in Kuala Lumpur.